Cover Story [W5256] - $14.00 : Yarn Tree, Your wholesale source for cross stitch supplies. A sewing set inspired by antique American overshot woven coverlets by Ink Circles. 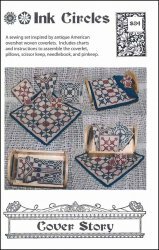 The set includes a scissor keeper, pinkeep, needlebook, the coverlet, and some throw pillows. The chart pack includes all of the finishing instructions for each item. Stitch count: Coverlet 97 stitches square, Scissor Keep 91 stitches square, Needlebook 41 stitches square, Pinkeep 41 stitches square, and Pillows 15 and 25 stitches square.